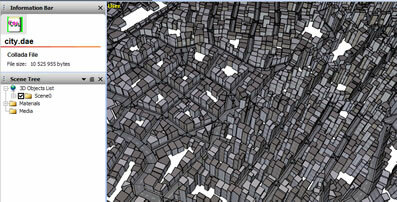 I presented a paper at GDTW in Liverpool titled 'Citygen: An Interactive System for Procedural City Generation'. The paper provides an overview of the system describes in some detail the concepts of adaptive roads, city cell extraction, road growth and snapping algorithms. The accompanying presentation illustrates the application of these concepts in the citygen app and includes video capture demonstrations. The COLLADA format provides a common format to share scene data between tools and enable Citygen to be easily integrated into the development pipeline. Collada is suppported to some degree in all of the following 3ds Max, Maya, Blender, Deep Exploration (^shown above), Lightwave and XSI. The lot division algorithm works by subdividing each region using a deviated perpendicular bisector of the longest side. Two or more polygons can result from the operation and subdivision is continued recursively until a target lot size is reached. Lots that do not have direct road access are excluded from the final set. I have another poster at Siggraph this time titled 'Interactive City Generation'. The poster shows some of the work that I have implemented including the new lot division code and road generation. The poster is a little short on detail but it is only an overview. There is also a short section and building screenshot of the Shape Grammar work graham is doing. The citygen application is usable at the moment but I'm only beginning to work with it so much better results should be possible in a few weeks. I have written a survey paper for publication in the ITB Journal that outlines the existing approaches to procedural city generation and provides a discussion into the merits of each approach. All references are included so it should be a useful paper to begin research into procedural city generation. Stay updated on my meandering thoughts & activities via Atom syndication.